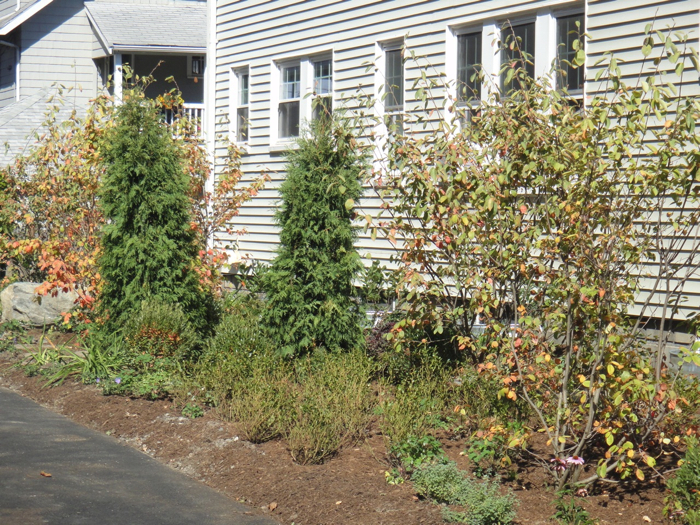 The suburban lawn outside this home in Belmont, Massachusetts, was recently replaced with mostly indigenous plants, such as blueberry and raspberry bushes, serviceberry trees, and hardy perennials, along with a variety of fragrant herbs that withstand light treading. 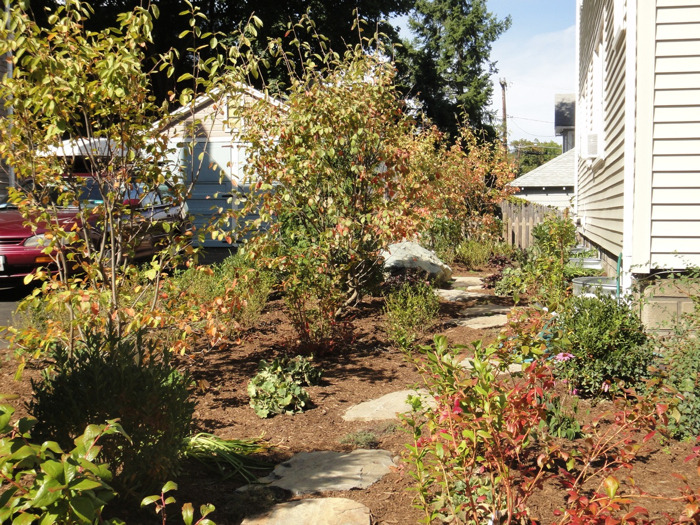 Homeowners Hillary Wyon and Paul Williamson opted for this organically maintained garden (designed by Elizabeth Gourley) over the traditional turf to conserve water, eliminate mowing, and avoid use of synthetic chemicals. 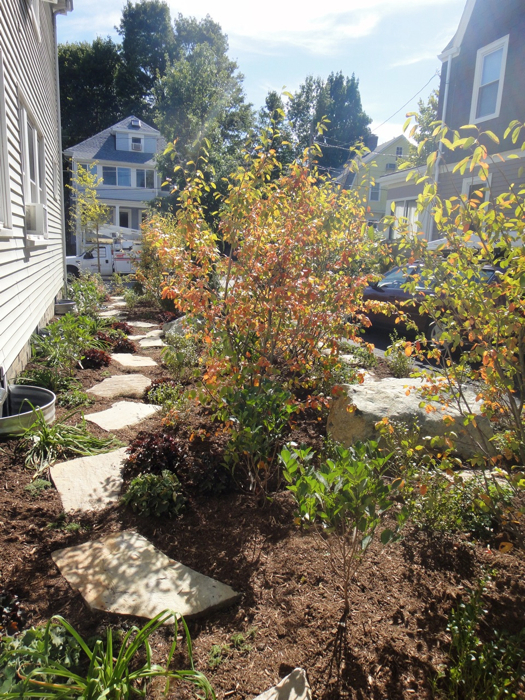 Landscape plan designed by Elizabeth Gourley for Hillary Wyon and Paul Williamson. In the gallery below, click the right arrow to view additional images beyond what appeared in print. Think of the scale. 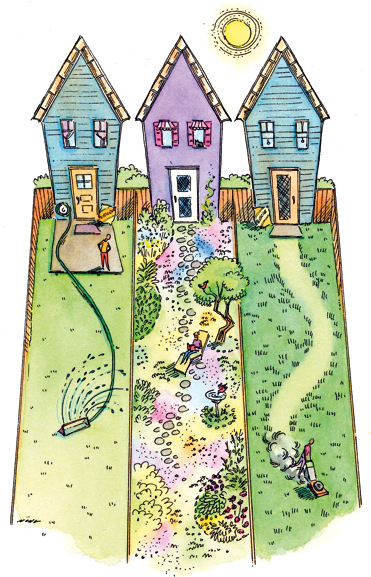 Of the 116 million American households, only about 25 percent do not have yards or grass to take care of, says Bruce Butterfield, senior researcher for the National Gardening Association in Burlington, Vermont. If the typical suburban lawn is 5,000 square feet, he says, that translates into a huge portion of the American landscape, even if most are individual “postage-stamp-sized” yards. According to an analysis of NASA satellite data, turf covers about 49,421 square miles of American land--representing three times more acreage in the nation than irrigated corn. Lawns have been around in America in some form since the turn of the eighteenth century, although they were minimal and there to feed (and were maintained by) grazing animals. Thomas Jefferson and George Washington, among other well-off landowners, were influenced by the majestic grounds of contemporary English gentry and aspects of those landscapes, including lawns, turned up on their own estates. In her 2008 New Yorker article, “Turf War,” Elizabeth Kolbert credits Andrew Jackson Downing, a nursery owner, with publishing the first landscape gardening book for Americans in 1841, encouraging people to beautify their front yards through careful plantings and sculpting of the landscape--ideas that influenced Frederick Law Olmsted’s grand lawns of Central Park, as well as planned suburban communities like Riverside, Illinois. The prevalence of the more expansive, individually mowed lawn appeared in the later nineteenth century (the first push mower became available in 1870), along with the burgeoning American suburb. The Garden Club of America, founded in 1913, also promoted tidy personal lawns and yards, running contests and publicity drives to promote “a plot with a single type of grass with no intruding weeds, kept mown at a height of an inch and a half, uniformly green, and neatly edged,” reports Virginia Scott Jenkins in The Lawn: A History of an American Obsession. Also significant, Peter Del Tredici points out, was the collaborative research venture between the U.S. Department of Agriculture and the U.S. Golf Association that resulted, by 1930, in feasible combinations of lawn grasses that would grow well in a variety of American climates. The marketing of herbicides, pesticides, and fertilizers came later, sometimes in conjunction with chemical research associated with World War II. He would argue that there is no true functional, natural, vegetative substitute for the “soft carpet” of a well-maintained lawn: “Ground covers and meadows do not fit in that category.” Instead, he favors the “freedom lawn” concept discussed in Redesigning the American Lawn. That calls for a green expanse composed of a community of plants that “sort themselves out according to the topographical gradient that is most peoples’ lawns,” he explains. There are varying soil conditions, and spots that are sunnier or shadier, or wetter or drier, areas closer to trees and other root systems, et cetera. The freedom lawn is not all grass, or even one kind of grass: it has dandelions, clover, and buttercups, too. “You can plant crocus and violets and ajuga. 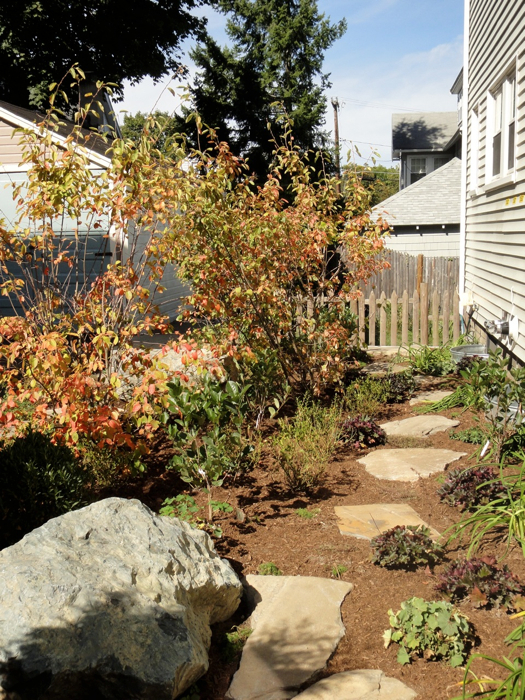 You can still walk on it and let them spread on their own with minimal mowing and no petrochemicals,” Del Tredici points out. “Before herbicides were invented and promoted, people accepted dandelions and clover and other flowers as the inevitable reality they are.” The problem is not the lawn, per se, he emphasizes, but all the petrochemicals and water used to keep it green and weed-free. 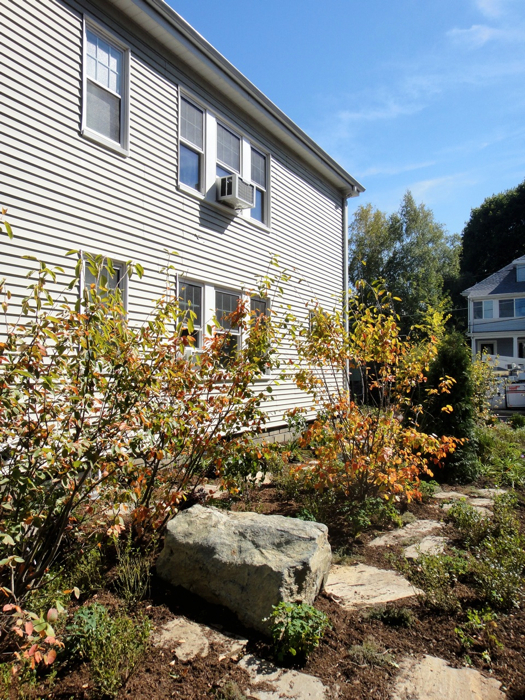 A more sustainable alternative to the usual lawn has been installed outside Harvard’s LEED-certified 46 Blackstone Street building in Cambridge. The space is hilly and contains various fescues--hay-like grasses--that are low-mow (three times a year) and drought-resistant. But the new look has taken some getting used to; not everyone adores the less controlled look, or the ryegrasses that were also planted initially and grew two to three feet high. “It could look like a hayfield, and people joked that I should get some goats out there,” Carbone reports.